International Basketball League Rookie of the Year Chehales Tapscott (6'5''-F-90, college: Portland St.) has headed overseas to Luxembourg after signing with AS Soleuvre in the countrys Diekirch League. Tapscott, who was a Big Sky all-conference player at Portland State, starred for the IBL's Salem Soldiers last spring. He led the league in scoring with 28.5 points per game and finished second in rebounding with 12.7 boards per game. Tapscott was named a first-team IBL All-Star at the end of the 2012 season and was the leagues only athlete to pick up two Player of the Week awards. 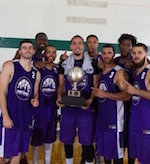 At the conclusion of the IBL season, Tapscott joined other IBL All-Stars and competed in the 39th annual Southern California Summer Pro League, where he was tagged as a "Diamond in the Rough" and selected as a second-team All-Star after averaging 19 points and 11 rebounds per game. While in Southern California, Tapscott was invited to workouts with both the L.A. D-Fenders and Bakersfield Jam of the NBA Development League. Tapscott signed a contract with the D-League in advance of the leagues draft on November 2 but was not selected by a team, leading to his decision to head overseas and join AS Soleuvre in Luxembourg. Tapscott suited up for his first game with his new club on November 25, leading AS Soleuvre with 28 points and 13 rebounds in a 78-70 win over BBC Residence.